Right -Left: Vice President of the Claims Conference in Israel Shlomo Gur, Ambassador of Japan in Israel Mr. Koichi Aiboshi, Limmud FSU founder Chaim Chesler, Chair of Vilnus Jewry Miki Cantor. 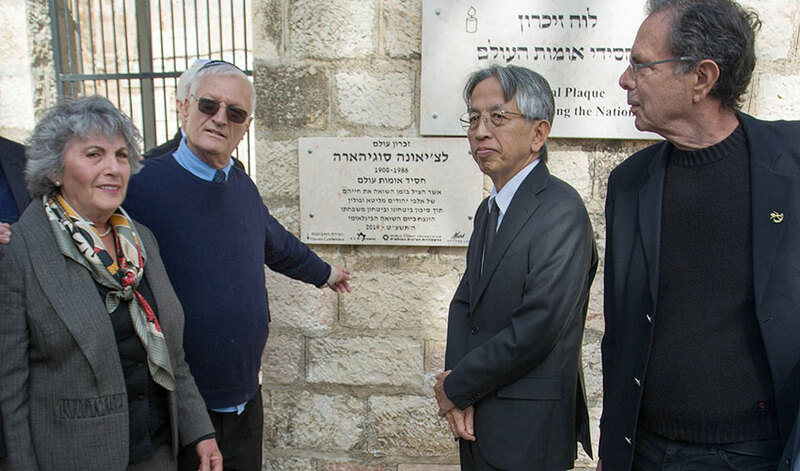 To mark the International Holocaust Remembrance Day, a special event took place today in the Chamber of the Holocaust on Jerusalem’s Mount Zion, during which a plaque was unveiled in honor of Chiune Sempo Sugihara, who was responsible for saving thousands of Jews during the Holocaust. The Chamber was the first museum devoted to the Holocaust in Israel and was established in 1949. The event was initiated by Limmud FSU, the Claims Conference, March of the Living and World Zionist Organization. Japanese diplomat Chiune Sempo Sugihara, who helped to save more than six thousand Jews during the Second World War, by supplying to them transit visas to escape from Nazi-occupied territories and travel through to Japanese territory. Shlomo Gur, the Vice President for Israel, Claims Conference said: "The mention of the deeds of Sugihara and other Righteous Among the Nations is meaningful especially in the current period when there is an awakening of anti-Semitism around the world. We in the Claims Conference see great importance in teaching the history of the Holocaust, which includes, of course, the heroic actions by the Righteous Among the Nations, who saved Jews while endangering their own lives and their own future." Following the ceremony, a plaque honoring Sugihara was unveiled in the Chamber of the Holocaust, and a special song, "Way of the Samurai" honored Sugihara's memory, performed by the singer Avner Budagov. Rabbi Yitzhak Goldstein, chairman of the Chamber of the Holocaust, said after a prayer in Sugihara's memory: "The ceremony in honor of Sugihara has profound significance beyond the rescue of thousands of Jews during the terrible Holocaust years. The consul was a partner in saving a meaningful part of the soul of the Jewish people because the survivors were the main avenue of the talmidei hakhamim who restored the world of Torah and yeshivas after the war." Survivors and several senior officials took part in the ceremony, among them Japanese Ambassador to the State of Israel Mr. Koichi Aiboshi that said: "In 1940 Mr. Sugihara made a really faithful decision, without consulting anybody, but on his own conscious. This decision saved thousands of lives. For diplomat whose home country was a practical ally of Nazis Germany, this was extremely courage action." Avram Cimerring, son of Israel Yoel Cimerring who was saved by Sugihara declared: "My father R.I.P. came to Israel in 1941 after he was saved by Sugihara. Now our family, with children and grandchildren is 60 people. With the help of Sugihara, this is our victory over the Nazis."